What a fun cake to do!! A friend and coworker had given us wonderful news…she was expecting twins!! Being the mom of twins myself this announcement held a place dear to my heart. All of the memories came rushing back just hearing the special news. The bottles…the diapers… the double packing for every outing…man was I exhausted!! But more than that…the double smiles…the double hugs….and the MORE than double love!! I knew what lay in store for my sweet friend…and I couldn’t have been happier for her. We decided to give her a baby shower at work…so we began planning for the big day. Another coworker handled all the details and asked if I would be interested in doing the cake….WELL YEAH!!!! I would be honored!! The event was to be a jungle theme….so the first thing that came to mind of course was little monkeys. I crafted the monkeys from fondant as well as the bananas and palm leaves. The tree trunks were chocolate filled pirouettes purchased from the dollar store. I think I used around 120 of those around the sides of each tier also. They stuck nicely to the buttercream icing I had already put on the cake. All that was left to do was place all the pre-made deco on top and that was it…. 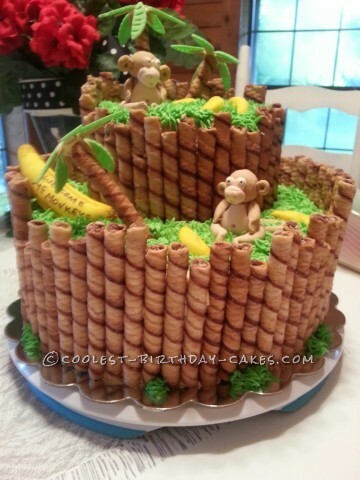 Love the cake and want to make it this weekend for my monkey obsessed little sisters b-day, just curious how you made the grass- green dyed coconut? Hi Nicole..ty for your comment..it is buttercream icing with green Wilton color. I used a grass tip for application. Ty again and eat cake!! !